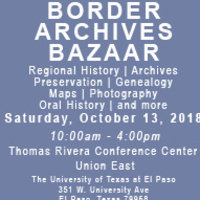 The Border Archives Bazaar is a FREE, fun event for the community to interact with fascinating historical collections from the border region. See rare documents, photographs, maps, publications, and more that highlight the unique history and culture of the area. Learn about the role that archives play in preserving and promoting history. Archivists, librarians, and museum curators from more than a dozen local institutions will discuss and answer questions about archives, regional history, and preserving documents.